The Sri Lankan Government is likely to ban the latest edition of the Time Magazine after political Buddhist groups have taken offence at an article appearing on the news magazine’s cover, Colombo Telegraph learns. The Bodu Bala Sena Group has lobbied the Media Ministry and Secretary to the Ministry of Defence Gotabhaya Rajapaksa to ensure the offending issue never reaches the news stands in Sri Lanka, Media Ministry sources said. 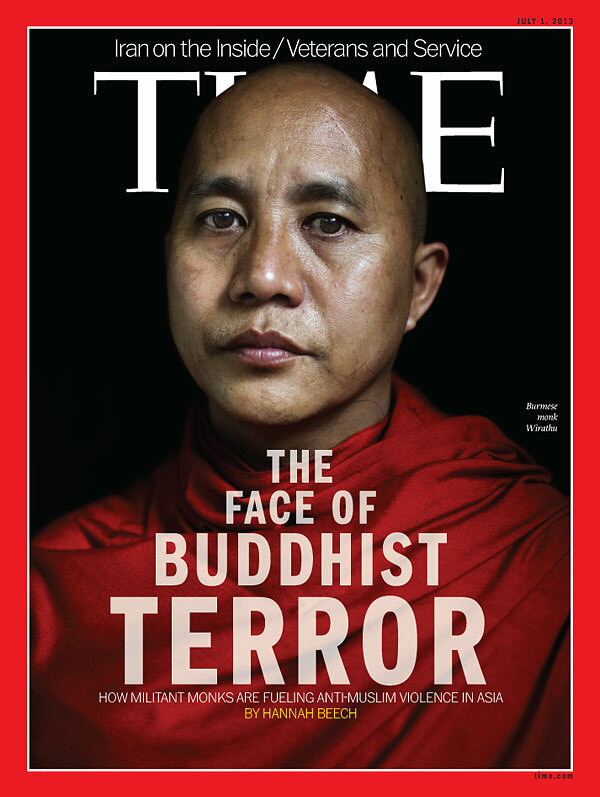 The cover story on the July 1 issue of Time Magazine is entitled ‘The Face of Buddhist Terror and features Myanmar’s extremist monk Wirathu, who has been accused of stoking anti-Muslim sentiments with his 969 movement, launched in February, which calls on Buddhists to boycott Muslim shops and businesses. There have been at least three anti-Muslim riots this year in central and northern Myanmar, leaving thousands homeless. In June 2012, Buddhist communities in the Rakhine State attacked Rohingya Muslims, leaving 167 people dead and 125,000 people homeless. Media Ministry Secretary Charitha Herath is reportedly consulting with Media Minister Keheliya Rambukwella about how to approach the issue. According to Ministry sources, the BBS is demanding that Herath consult with the Defence Secretary to tear off the cover story in the magazine before it is allowed on the newsstands in Sri Lanka. If the ban goes ahead, this will be the first time an international magazine is banned in Sri Lanka for a story that has nothing to do with Sri Lanka directly. Sources said the Government is planning to ban the online version of the story as well. The Colombo Telegraph has been unable to reach Charitha Herath for comment. The Myanmar government has already banned the issue. 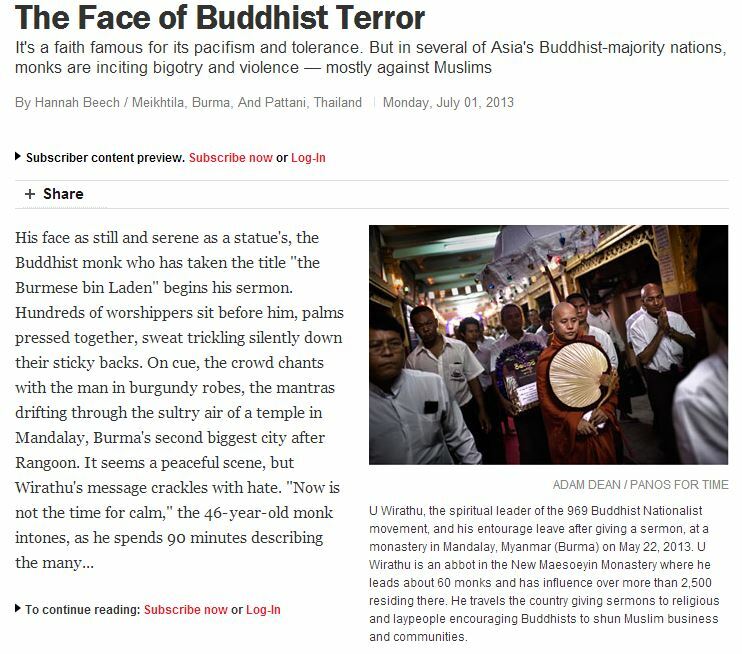 “The article entitled ‘The Face of Buddhist Terror’ in Time magazine July 1 issue is prohibited from being produced, sold or and distributed in original copy or photocopy in order to prevent further racial and religious conflicts,” Myanmar government spokesman Ye Htut posted on his Facebook page. We do talk about them every day. Why are you scared of talking about Buddhist crimes? Yeah, because of so called peaceful Buddhism, our beloved Myanmar military regime himself kill his own religion people Buddhist monks. The need for Myanmar like mechanism to deal with Islam. 2:191 And slay them wherever ye find them, and drive them out of the places whence they drove you out, for persecution is worse than slaughter. And fight not with them at the Inviolable Place of Worship until they first attack you there, but if they attack you (there) then slay them. Such is the reward of disbelievers. 2:193 And fight them until persecution is no more, and religion is for Allah. 2:244 Fight in the way of Allah, and know that Allah is Hearer, Knower. 5:33 The only reward of those who make war upon Allah and His messenger and strive after corruption in the land will be that they will be killed or crucified, or have their hands and feet on alternate sides cut off, or will be expelled out of the land. Such will be their degradation in the world, and in the Hereafter theirs will be an awful doom. In Islam, everything is governed under Quran. Children are taught only Islam, but not even a word about other religions. They are taught and trained to act as killing machines and spread Islam. This is the reason why Islam is very aggressive and Islam itself is terrorism. Muslims migrate to Non-Muslim country and slowly (yet steadily) grow their numbers. They act very innocent and get all the benefits under the majority. Most of the other civilised religions do not depress other religions. And Islam grows with no threat from the existing principle religion ( Buddhism or Christianity) once they grow the numbers, then ask for sharia and special laws. And when they can, they take the power of the country and make it a Muslim country. No democracy , no mercy for minorities there onwards. Non-Muslims are depressed and killed. It is rather apparent the reference to “satin” in Christianity and reference to “mara” in Buddhism must be referred to the same, that is Islam and its God Allah. According to Christianity and to Buddhism, there is a dooms day; where e the world destroys, when people are sinners. It must be referred to a situation where Islam conquers the world. Or rather “satin” or “mara” conquer the world. Then the glory of the world is gone. And world get destroyed itself. So via democracy, kindness the world simply cannot deal with Islam. Islam is such that It is like a cancer. By loving the cancer or by been nice to cancer, you can’t get rid from that. You need to treat the cancer in such a way to get rid from that. The mechanism in Myanmar, is thus rather justified. Since they understood that Islam is growing and soon, they will be slaves under Islam hypocrisy and depression. A problem which cannot be addressed democratically or with a human feelings. Look, what happened in all Buddhist countries, in all peaceful countries. Islam enters and they simply destroy it. E.g. Sri Lankan, India, Maldives, Bangladesh etc etc. The America Approach is better, but is in macro level. Mass scale Muslim depression. While America treats the would cancer like that, small nations like Myanmar or Sri Lanka need to act in a grass root level to get rid form the world cancer. Sri Lankans, if they need to be safe, have to think about Something like in Myanmar, before it is too late. I think Sri Lankan Buddhist are ( or they used to be ) too good and too innocent. Bodu Bala Sena is doing a marvellous duty by making it clear to Sinhalese. Let’s hope the Glory of the world will remain longer, with No Islam Hypocrisy. Jason David, I know you are extremely Islamophobic thru your views expressed. Yes, it is true in the Quran, Allah’s divine message does include persecution of those who are non-Muslims, but it was due to special circumstances. When Islam was being ‘re-introduced’ by the Prophet, those who converted were being persecuted by those opposing. They were chased out of their homes, killed, ill treated, and thus had to leave Mecca and traveled with the Prophet to Medina where they were made to feel most welcome. After some period of time they regrouped and returned to Mecca. This time they were much stronger, and thus had the upper hand, and were better prepared to face up to any type of intimidation. At that point an agreement was made either to accept Islam or pay the Jizya (tax) to get protection, or be prepared to fight and die (thru declaring war). This whole historical episode is steeped in the cultural values and practices existing at that time, the rules within tribal concepts (Quraishis, Ansaris etc) of controlling party interests and many other such values. Without you knowing any background to how or why such divine messages were declared, you pick up some pieces of Quranic test, completely out of context and flog it like a mad man in a city center. You need to read more (Quranic translations and explanations ‘Tafseer’) or listen to Islamic scholars and question them to ascertain correct and true knowledge. Just like World War 1 and 2, there have been wars fought throughout history, and this was not unique to the birth of the Islamic civilization only. @ Jessica states Islam however, whoever says what, Is a barbaric religion. Why the prejudice against Islam only. Judaism, Hinduism is replete with wars fought in the name of Religion! Just look at the verse quoted above. You do not have to be genius to understand the defensive nature of the verse! The opposite command will be to allow the enemies to slay them and allow Law and order to perish from the land, for women to be abused, for the girl infants to be buried alive, for Justice to be negated for the poor and weak! Is this ok and a civilized act in your opinion? What have you and your islamaphobic peers to say now. This is nothing but the demonstration of a dictatorial and communistic state run by the hooligans of the Matara ‘Raja” family and the monsters who are looking for power in saffron robes ! Buddhism did need the BBS to survive for 2500 and will not need their support to do so. In fact it is their involvement that will help destroy Buddhism in Sri Lanka. All hail the BBS !!!!!!! To all those who defend the actions of the government and condone the anti-Minority stand, my submission is that you must have something to hide! If you are not guilty why go to the extreme of banning an internationally read magazine? There is a pithy Sinhala saying- “Puhul hora karen dene”. Is the government guilty as charged, I wonder? Well, in my view, I think politics come first before religions. As long as each individual trusts in his own religion, it’s ok. We do not need to force other to take sides in religion.